Living your life out on the road fighting mythical creatures can get a little cold and lonely sometimes. We can help with cold part but not so much with the lonely, sorry. 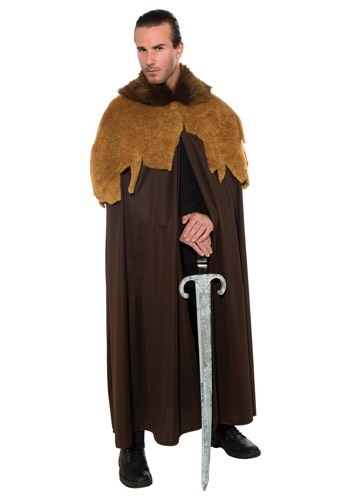 Be prepared for any climate with this Men's Medieval Warrior Cloak. Plus, it's great for trying to blend in with the townsfolk! In the Medieval times you never know what you may encounter so you better off sporting a cloak that is suitable for any occasion. What if you cross paths with a beautiful lady or even a king, you’ve always got to be prepared for what lies ahead. Our Men’s Medieval Warrior Cloak will have you looking like the noble warrior we all know that you are. The full length dark brown cloak will keep you nice and toasty during those winter months but opens in the front for the spring days when you need to feel the breeze! Topped with luxurious golden brown fur you may even be mistaken for a king, and for good reason you do look like royalty after all. If you are feeling the whole mighty king thing then we’ve also got a gold king crown that would match your warrior cloak perfectly! Times are going to be tough out there and you need to be prepared, you’ll definitely need a sword to fight off any trespassers of your village or animals that you may encounter on your journeys. Our deluxe battle sword is the perfect accessory to keep you safe on your many journeys as a medieval warrior. Get out there and slay!